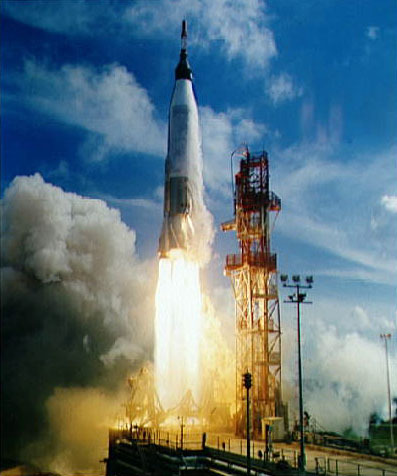 A half-century ago today — September 13, 1961 — the unmanned Mercury-Atlas-4 (MA-4) test flight launched from Cape Canaveral. MA-4 was the first orbital test flight of the Mercury program; the previous flights had all been sub-orbital. The payload consisted of a pilot simulator (to test the environmental controls), two voice tapes (to check the tracking network), a life support system, three cameras, and instrumentation to monitor levels of noise, vibration and radiation. It demonstrated the ability of the Atlas rocket to lift the Mercury capsule into orbit, of the capsule and its systems to operate completely autonomously, and succeeded in obtaining pictures of the Earth. After one orbit, the capsule splashed down east of Bermuda, where it was recovered for examination.